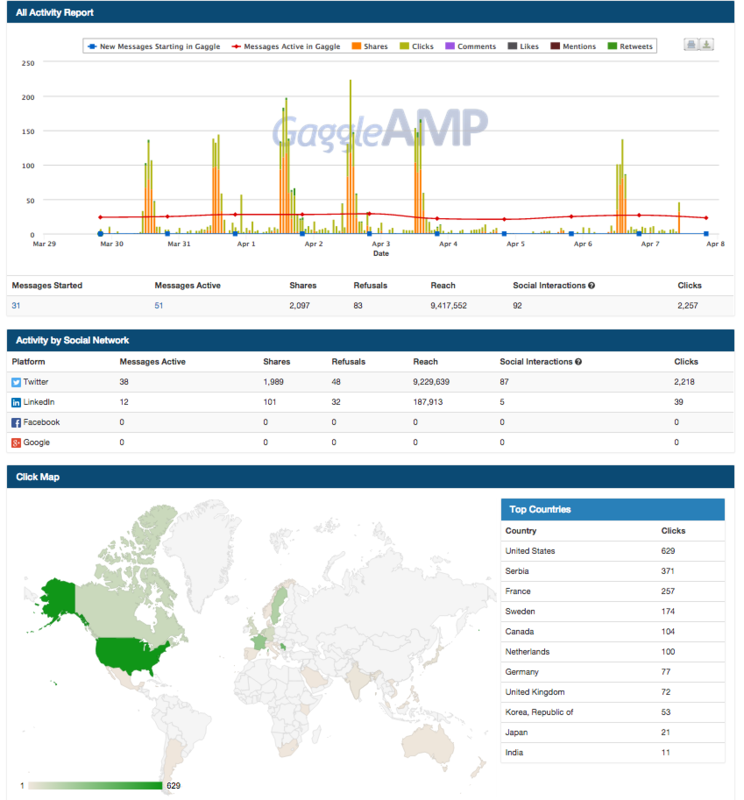 GaggleAMP Amplify Review: "GaggleAMP associate engagement"
GaggleAMP is being used by our marketing department with users from departments partnering to bring associates company social posts. The ability to easily publish social posts to the different sites is not new. But bringing in your company or team on it and getting them involved with sharing and liking is fundamental in efforts to grow and engage more on the socials. Also, love the gaming ability with the leaderboards. Easy to tell associates what posts to like and share. Especially like that we can point them to like or share industry posts. Easy to get others in organization to sign up. Also offers app and browser app. Sometime if you have a link in you post, GaggleAMP won’t carry the link forward into the post you share. It can also take GaggleAMP some time to automatically pick up a post and alert your users that it is available to share. Suitable for any sharing of company, partner or industry posts with your associates to engage with on their own socials networks. Nice way to make sure everyone is on message. Less appropriate with small orgs. 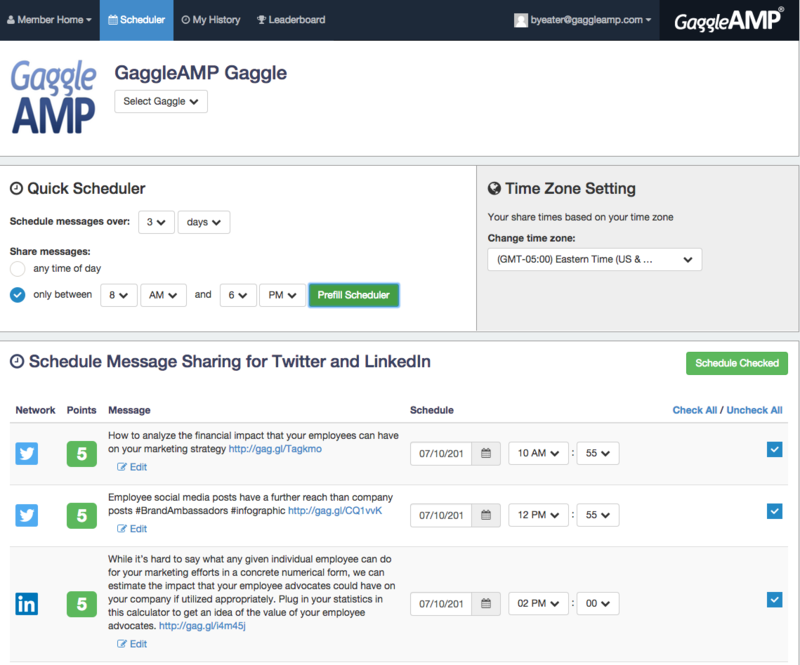 GaggleAMP Amplify Review: "The Easy to Use Employee Advocacy Tool"
GaggleAMP is being used to expand our Employee Advocacy Program across the whole organization. The tool enables employees to quickly and effectively share the organization's message across a multitude of social platforms with the click of a button. Employees can accrue points for the most shares and those that accrue the most points are rewarded by the organization. As a result, the company gains increased mindshare. 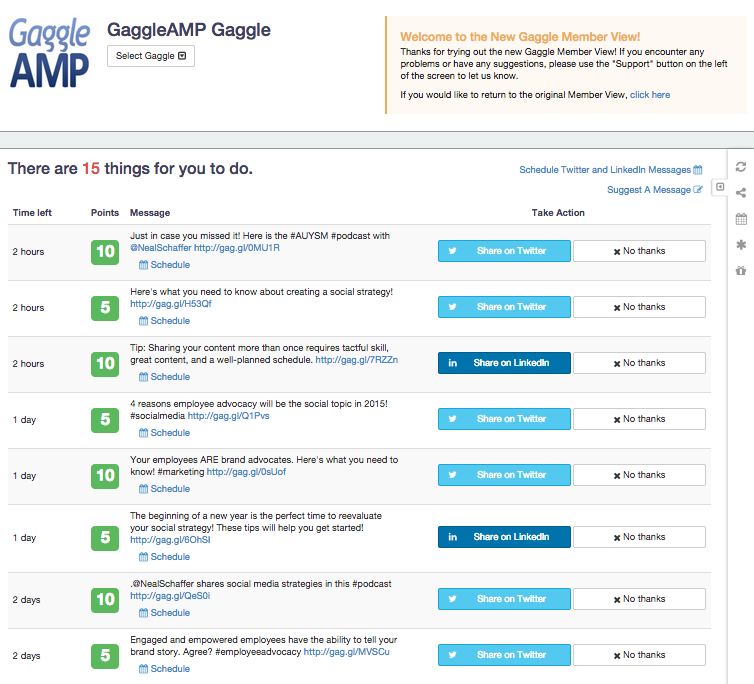 GaggleAMP offers a 2-week trial to see if it resonates with the company. With a click, you can share content that appears organic. 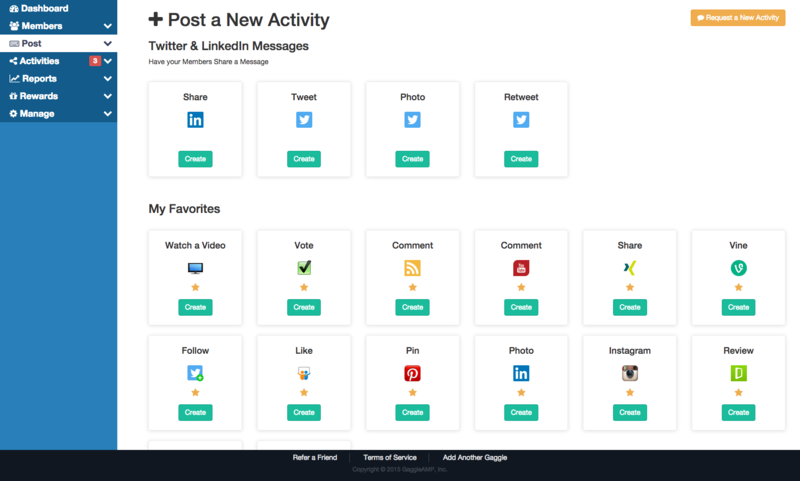 It easily integrates with social platforms such as Facebook, Twitter, and LinkedIn. Admins need to unlock the capability for regular users to modify and edit amplified messages. The licensing model may not work for many small businesses. Users can't augment the posts with their own images. The tool is well suited for medium and large companies that are looking to gain mindshare and branding exposure by leveraging their employee's social presence. It may not suit small companies due to the license pricing structure or if there are so few employees to justify its use. We have an organization that has several practice areas that service diverse industries. We use several different GaggleAmp accounts to help our employees share pre-written messaging with their clients and prospects via LinkedIn and Twitter. It saves employees time and effort, ensures the messaging is on brand, and helps us extend our social reach beyond our corporate social media handles. It is very easy to upload messaging. Reporting tools are easy to use. Occasionally it is buggy. For instance, a few times our Gaggles have reverted to fewer shares that we actually purchase. Customer service has always been quick to fix it. It shortens URL addresses automatically, which is great, but sometimes it mistakes percentage signs or other symbols as URL addresses. It's a very cost effective tool for small or medium businesses looking to grow their social presence while having some control over branding/messaging. I would make sure you understand how many people will be willing to use it in advance so you understand which plan makes the most sense for you. If you need to customize messaging to various audiences, you may need to purchase more than one account. GaggleAMP is an online marketing platform that lets companies amplify their marketing efforts by leveraging individual employees and other stakeholders who agree to promote their stuff. These stakeholders get emails telling them they have a message to share. They can elect to share it, not share it, or even not share it and provide feedback as to why not, but anonymously. Has featureRobust analytics that can be connected to a marketing automation system for lead source reporting. 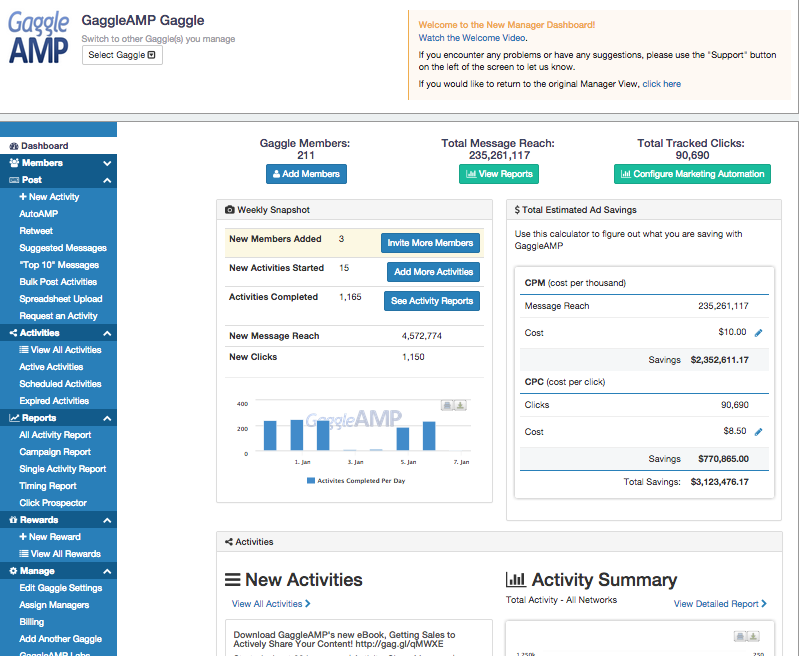 The manager dashboard gives the Gaggle manager a quick snapshot of what's going on in their Gaggle.Choose from 35+ actions to have your Gaggle Members to act on.Report on the results of your Gaggle activities. See share rates, clicks, engagements and where they are happening.The member view provides a simple view of actions and messages available. Acting take a simple click of a button. "Share" to share the message or "No Thanks". If a user declines a message/action there is an opportunity for them to provide feedback on why they chose not to share the message or perform the action. This helps the Gaggle manager learn the preferences of their member base and helps future content curation.The member view also provides an easy to use scheduler. Using the scheduler means that members don't have to log in every day to share messages. They can set their own mini drip campaigns and have messages spread throughout the week.